May is a magical month for teachers in South Korea. Spring is in the air, Buddha's birthday and Teachers' Day mark a couple of welcome three-day weekends down on the calendar, and it is also the month when students are rewarded after their first set of midterms with sports days and field trips. Last Friday we were both fortunate enough to be excused from the sports days at our respective rural schools, so we booked a hotel, circled a few popular tourist locations on the map, and headed off for a three-day mini-break in Busan. Busan is the second largest city in Korea after Seoul, and is well known for its lively atmosphere, foreigner-friendly hangouts, and the famous Haeundae Beach. Leaving Gunsan on the 8:20am express bus service we reached Busan just after lunch and immediately caught the subway down to Busan Station where we hopped onto a bus tour that took us around the east side of the port city. This was a great way to gradually orientate ourselves in this big new metropolis while we waited for check-in to open at our hotel so we could drop off our bags. If there were one lesson we wish Wellington and Auckland would learn from other cities it is that affordable, functional public transport systems are both possible and necessary. Underground trains in particular are a recurring source of delight to us due to their efficiency and ease of use, and Busan's system was no exception. The subway may be a simple pleasure, but being able to quickly, cheaply and easily move around a city despite a language barrier is something we value greatly. Perhaps, one day, if New Zealand gets a lot bigger and the population density increases, our dream will become reality. The hotel turned out to be much nicer than we were expecting. While small the room was still very tidy and comfortable, and even included a large double bed! This is important if you bear in mind that, due to the idiosyncrasies of the local education board bureaucracy, we have been sharing a twin bed since our arrival in Gunsan. We grabbed a complimentary bottle of water from the fridge and descended back into the underground. It cannot be stressed enough how convenient it is to be able to use the same pre-paid travel card across all of Korea, for buses, subway rides, and even taxi trips. It was late afternoon when we reached the first destination on our list, Beomeo Temple. Getting there proved to be a little sketchy, as Koreans do not cater much towards non-Koreans when it comes to signposting their attractions. With a bit of guesswork, vague (and inaccurate) instructions courtesy of the Korea Tourism website, and frequent checking of our GPS location, we landed on a bus that took us up a beautiful, winding, tree covered hill to the peaceful Buddhist temple that hides nestled against Geumjeong Mountain. The weather was serene, showcasing a rare blue sky, golden sunlight, and warm but not humid heat. Ready the camera! As you cross an old stone bridge the gentle sound of water running over rocks in the stream below welcomes you on to the entrance pathway, which is decorated overhead with a mass of colourful paper lanterns. At the end of this rainbow walkway we found an arch that contained four large statues representing the temple guardians. The one manhandling a fire dragon while crushing a man beneath his foot was especially evocative. Unsure of exactly where to go, and avoiding 'do not enter' signs whenever possible, we wandered around to the back entrance and eventually found ourselves walking by room after room of people praying by candlelight. Silently a group of monks passed us by. We followed them from a distance as they ascended a wooden structure that contained a giant drum, a bell, and a digital clock. One of the monks noticed us standing around and with surprisingly natural English invited us to stay and watch their musical performance at 6pm. And that is exactly what we did. It seems they all had a good time putting on the ritual show. After the meditative atmosphere of the temple we were ready for some of the energetic and modern culture Busan is renowned for. A short trip down the orange subway line brought us to the Pusan National University area. It was after 7pm and the place was packed. The narrow streets were full of young couples and students out shopping, eating, and generally enjoying their Friday night. The view from above was like a cinematic tableaux, wriggling with colour, noise and light. Despite our growing hunger we were able to resist the many food stalls that lined the pedestrian-filled roads. Coming from an international city like Wellington in a colonised country which continues to enjoy waves of immigrants from all over the world, it has been a little difficult for us to adjust to one particular aspect of life in Korea - the lack of variety when it comes to dining out. In Wellington we regularly ate Malaysian, Japanese, Chinese, Mexican, Thai, Indian, and Italian food, not to mention good old English pub food. While Koreans have embraced American fast-food and chain coffee shop culture, there is little else around that isn't Korean. Even our local Chinese restaurant in Gunsan, while greatly enjoyable, is heavily influenced by the Korean palate and local dining customs. When your sweet and sour pork is served with gimchi, yellow radish and other banchan, you know you're not in Kansas anymore. Luckily the radish is delicious. During our research the previous week we had learned there was an Indian restaurant in Busan and this is where we were headed for dinner on our first night. Despite the crowded streets the establishment was nearly empty, because even though the food has been altered to reflect local tastes, it appears that the average Korean is not overly interested in this particular international cuisine. Korean food is generally very subtle in its flavours so we found the curries a little tame, but it was nice all the same to sit down to familiar fare that resembled one of our comfort foods back home. Saturday morning heralded the most anticipated part of our trip to Busan - the aquarium. As we had predicted the Haeundae Beach facility was packed with young families out to catch a glimpse of some of the 35,000 marine animals on display. 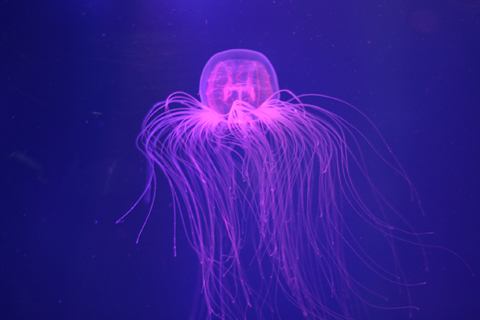 Busan Aquarium houses 250 different species of fish, shark, turtle, jelly fish, and shellfish, not to mention the penguins, otters, and Stephen's favourites, the finless porpoises. It was hard to get photos through the curved glass but we did our best. We took in all the aquarium had to offer, including a short glass-bottomed boat trip over a portion of their biggest tank, and a 3D adventure ride that did an admirable job of making one feel that they were plummeting into terrifying glacial crevasses. After a spot of lunch we headed out to the Shinsegae department store in Centum City. Shinsegae is the biggest mall in the world and houses a large cinema, a golf driving range and an ice skating rink, as well as beauty salons, restaurants, an extensive supermarket, and dozens of clothing shops. To be honest we found the mall a bit disappointing. We didn't go up to the driving range and the skating rink was small and seemed to cater only for children. The vast majority of floor space is taken up with more than seven storeys of designer clothing shops, in which we have no interest. The book and stationery level however is magnificent, and the Studio Ghibli figurine collection was beautiful and extensive. It was here that we stumbled upon Totoro, the newest and most regal member of our stuffed furry family. On Saturday evening we set out with a particular destination in mind - the curiously titled It's Always Sunny in Philadelphia theme bar and restaurant. The signage is large and bright and so we found the place quickly, only to discover that it had closed down and been replaced with some kind of small corporate office. Our alternative was the nearby Wolfhound Irish bar where we indulged in the traditional pub fare of greasy fish and chips and bangers and mash, washed down with a pint of Hoegaarden. We concluded the evening with a leisurely stroll along Haeundae Beach. The manicured shoreline is popular with young people enjoying ice cream and coffee as they are serenaded by the occasional busker. 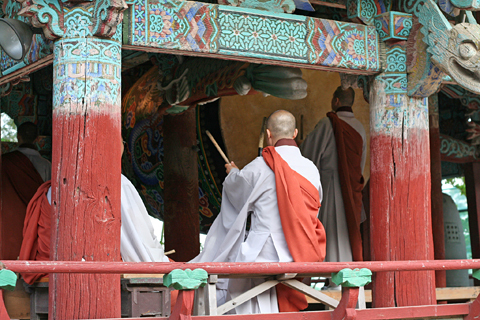 On Sunday morning we made the trek out to the Yonggung Temple. 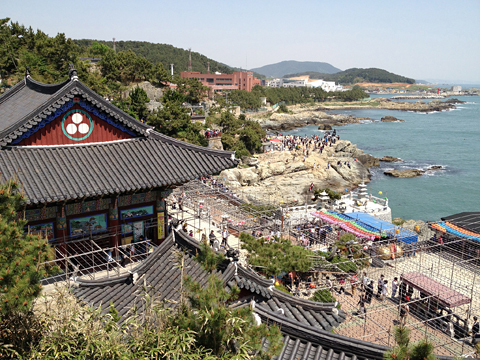 Yonggungsa is located on a rocky section of coast a few kilometres east of the city centre. The hundreds of Korean sightseers swarming around us proved that this is one of the most popular locations in the area, made particularly famous by the large statues of the 12 Chinese zodiac signs which stand sentry at the main entrance. The outside of the temple is painted with scenes from the life of Buddha, depicted in the beautiful traditional Korean style, and the entire site is watched over by a giant golden sculpture of the spiritual leader. Despite the crowding we were truly glad to have made the effort to come out to Yonggungsa and we highly recommend it to anybody visiting Busan. 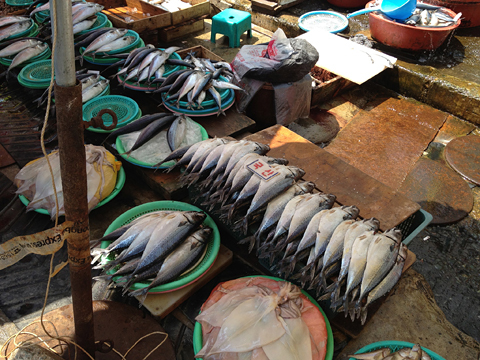 Our final destination in Busan was the Jagalchi fish market. Many people had recommended the market to us but we were somewhat skeptical going in. We've been to markets in Korea before and the prospect of voluntarily walking though cramped stalls of stinky fish products was not appealing. It turned out to be exactly what we expected, but the sheer quantity of seafood on display was impressive enough to make the visit worthwhile. Giant crabs may be terrifying, but they are hard to look away from. Probably the point of most interest to us were the older Koreans who tend each stall, as their worn faces emit an aura of welcoming gravitas. By 9pm we were back home in Gunsan and exhausted. The weekend was a treasure of great weather, new sights and fun experiences. Everything went off without a hitch and three days proved to be the perfect amount of time to get away from it all without suffering the fatigue of extended tourism. We'll no doubt end up back in Busan later this year. Click here for 85 more photos!